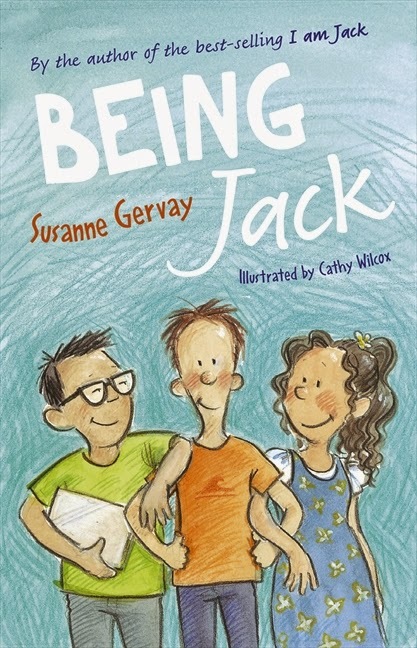 Being Jack was written by Susanne Gervay, illustrated by Cathy Wilcox, and published by Harper Collins Australia, 2014. Jack is in Year 6 now and still loves his photography, surfing, and crazy family. Things are going well for him, particularly at school where he isn't bullied any more. But he notices that his best friend Christopher is being taunted and is starting to miss school and hiding out and avoiding everyone. And when a football match turns ugly and Jack and Christopher witness some unfair dirty play, they know that, again, the bullying has to stop. Ages: 9+. I very much enjoyed the earlier Jack books: I am Jack, Super Jack and Always Jack. I also adored Monkey Baa Theatre's performance of I am Jack. Being Jack, the final book in the series, sees our hero Jack at almost 13, an immensely likeable and believable character. I think that’s one of the reasons kids relate so well to the Jack books - they can see themselves in Jack. His life is like theirs. He interacts with good friends, kids at school, teachers, and relatives. Jack loves his family but is often flabbergasted by their behaviour and their idiosyncrasies. Gervay knows how to make kids laugh, and humour there is, as well as drama and lots of moments for kids to think about and discuss. We see inside Jack’s head and feel what he feels. The present tense makes everything immediate, often almost like a stream of consciousness as Jack is bewildered by chaotic thoughts and real problems. How can he best help his mate, Christopher? Should he try to find and contact his real dad? How will that impact those he loves? The illustrations by Cathy Wilcox are minimal because this is a novel. But the little black and white sketches add a real charm to the story, and may help younger readers not to be daunted by the amount of text. I hope so, because this, like all the Jack books, is such a great read! In Being Jack, Gervay challenges us to think about bullying in all its forms. No longer tortured by bullies as he was in I am Jack, nevertheless, Jack has hard decisions to make about being a witness to bullying. For children, for all of us, these are important issues to think about, making Being Jack not just a book kids will very much enjoy, but one that nudges them towards taking responsibility for their own actions.